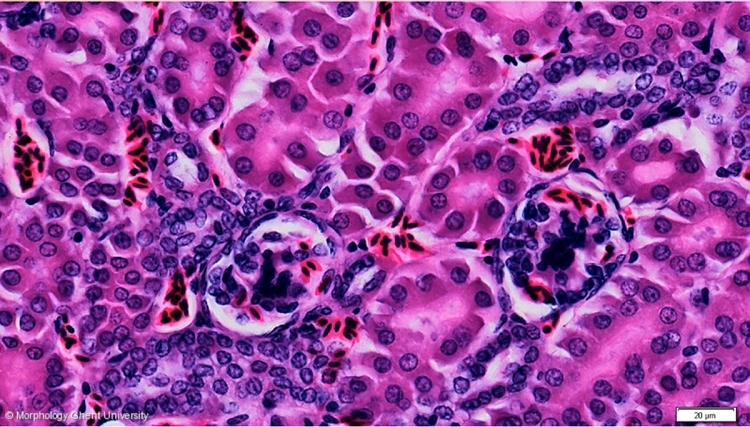 The proximal convoluted tubules arise from the parietal epithelium of Bowmanâ€™s capsule at the urinary pool of the renal corpuscules. The proximal part of these tubules is the analogue of the proximal convoluted tubule (tubulus contortus proximalis) of mammals, the distal part is the analogue of the pars recta of the proximal tubule in mammals (tubulus rectus proximalis). Both parts have a strongly stainable cilindric epithelium with a luminal brush border. The distal convoluted tubules correspond to the distal convoluted tubules in mammals and are lined by paler cuboidal cells without a brush border. Sections through the intermediate tubule of the cortical nephrons are scarce. They have a small diameter and a dark colored low-cuboidal epithelium without a brush border.